Admire the incredibly scenic beauty of coastal Karwar and spend the night in comfortable Swiss tents near the Kali River. 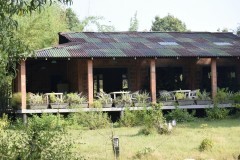 Here, you can go ziplining across the Kali River and embark on a thrilling 2-hr session of either kayaking or canoeing. You can also take a dip in the river, take a stroll to spot several different birds or simply relax with beautiful riverside views. Alternatively, you can head out to explore Karwar and visit the city's beaches, and spend the night at a quaint campsite, surrounded by large meadows and fields with trees and bushes. Your campsite is located on the banks of the River Kali, a short distance away from the Karnataka-Goa state border, on the outer edges of the Cotigao Wildlife Sanctuary. On this camping trip to Karwar, you'll stay in Swiss tents with comfortable beds with blankets and pillows. These tents are located on the river waterfront as well as further away from the river, near the mangrove forests. 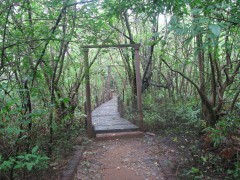 • Explore the scenic delights of coastal Karwar. • Go kayaking or canoeing on the Kali River. • Spend a night in comfortable Swiss tents. Camping at Karwar is a non-strenuous activity. However, if you have any cardiac or respiratory conditions, or suffer from knee or spinal problems, please consult your doctor before booking this trip. For cancellations made 7 days or more before check-in date of the Karwar camping trip: 50% refund. For cancellations made less than 7 days before check-in date of the Karwar camping trip: no refund. Check-in time at the campsite can be changed to suit your convenience, subject to availability. You'll be required to check-out 24 hrs after your check-in time. Bookings for travellers younger than 5 years of age are not charged. Bookings for travellers between 5-11 years of age are charged at a discounted price of 50%. Bookings for travellers older than 11 years of age are charged at full price. Prices quoted may be subject to a premium during long weekends, holidays and special events. There is no pick-up for this Karwar camping trip. There is no drop-off for this Karwar camping trip. Day 1 of the Karwar camping trip: Check-in and enjoy! Check-in to the campsite by 11:00 hrs and freshen up in your Swiss tents. After a stroll around the camping grounds to explore the area, you can have lunch and spend the day at leisure. 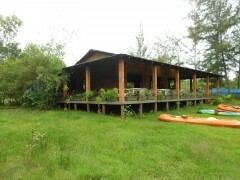 At the campsite, you can go ziplining across the Kali River or embark on a 2-hr session of kayaking or canoeing. Alternatively, you can also relax at the campsite with beautiful riverside views or head out to explore Karwar city. Return back to the campsite by dinner time. Overnight in Swiss tents at the campsite. Views of the Kanwar campsite. Wake up to early morning views of the Karwar sky and spend some time on the river bank. Post breakfast, you'll check-out of the campsite by 11:00 hrs. Your trip ends here. All equipment required for adventure activities: harness, life jacket, paddles etc. Personal expenses such as apparel, gear, additional meals or beverages etc. Check-in time at the campsite is 11:00 hrs. You'll be accommodated in Swiss tents that come with a bed with blankets and pillows. Today's meal package includes lunch and dinner. Stay in comfortable Swiss tents. Today's meal package includes breakfast only. You can check out of the campsite by 11:00 hrs. Karwar is connected to most major cities via trains to the Karwar railway station and flights to the Dabolim Airport in Goa. The campsite is located 25-km/45-min drive from the railway station and 100-km/3-hr drive from the airport.